Just Before Sunrise, as the fog lifts from the pool, the light reveals the tapered backs of male swimmers in Speedos concluding their morning workout. Nicky O’Hare, a promising freshman recruited to the Tampa Bay University swim team, shows promise both in and out of the pool. The lean Irish kid with the ‘boy-next-door’ good looks from Brandy, South Dakota, is likely the most talented swimmer on the team. Ready to experience all that college life has to offer, Nicky has even put finding a boyfriend on his wish list. Coach Phillip Silva, a former Olympic swimmer with a once-impressive swimming career, has recruited Nicky as part of his mission to rebuild the University’s failing swim program. Focused on the upcoming season, Phillip’s real challenge will be keeping his secrets and demons submerged below the surface. All seems well until one night when Nicky and Phillip end up at the same Fourth of July celebration. With fireworks in the sky, the hot and humid night reveals the attraction between the two. But can these boundaries be crossed? Suddenly forced to reevaluate his life, Phillip is met with the moral dilemma of discovering true love with the University’s rising star. Before Sunrise presents a story of friendships, love, complicated relationships, and deception, woven into a hard-earned happily-ever-after. Bryan T. Clark, author of Ancient House of Cards, has again masterfully crafted a romance where the fine line between right and wrong must be resolved for love to survive. The romance in this story is sweet. The moral dilemmas, however, are harsh and address touchy subjects that often get in the way of romance, friendship or goals. 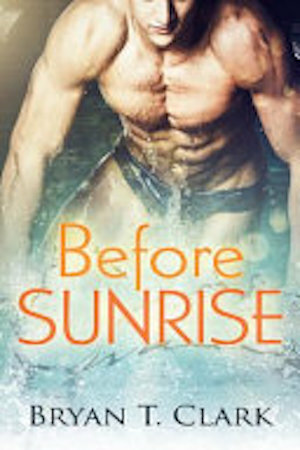 Before Sunrise is the story of a young man’s college years as he progresses in his goal to swimming at the highest competitive level, earning a degree, finding love and figuring out exactly what he wants in life. Nicky is an extremely talented swimmer, and his college coach recognized that from the time he first saw Nicky swim. Nicky wanted something else from Coach Philip from the moment he met him. And thus begins a tale of making adult decisions. When we first meet Nicky, he already is a mature young man at 18, who knows who he is and what he wants. Or thinks he does. His parents have given him a loving and somewhat sheltered life growing up. Nicky respects and loves them and wants to make them proud. As he spends more time away from them, Nicky begins to form his own judgments of right and wrong. Philip is a broken man who hides his scars, physical and mental. In order to be more than a swim coach for Nicky, Philip has some hard decisions to make, decisions that may ultimately take him away from Nicky. The secondary characters, Nicky’s friends and Philip’s co-workers, play major roles in the story. Mr. Clark does a masterful job of developing all of the characters in this story so they play out their parts in this drama in such a way that you will become very invested in them. Tyler, the teammate whose life before college surprises everyone; JB, fighting to stay out of the ‘hood and become the man he wants to be; Conner, raised with so much hate; other teammates and coaches who have their own personalities and agendas that clash instead of bond. This is an excellent book, full of surprises and romance that is harder to earn than any athletic award. I highly recommend Before Sunrise as a great read and Bryan T. Clark as a master storyteller. Don’t let the blurb’s warning about an “unexpected ending” worry you. Sometimes life’s unanticipated events lead to the greatest happiness ever after. Touching story of forbidden love and discovery. Great characters. Heartfelt story. Nicky O’Hare’s only goal is to have the best swim times to impress his new Coach Phillip Silva. He has to learn to maneuver himself in this new world of gay and straight young men at his new school and swim team at Tampa Bay. Some poor choices, naiveté and youthful self doubt complicate his life as he gets increasingly more serious about Phillip. We watch his growth and increased confidence about himself build as he finds his place in this sometimes confusing competitive world. Does his coach feel anything for him, or is this just another youthful fantasy? And what could possibly come of it? A sweet M/M romance that wriggles its way into your heart, gay or straight—after all love is universal. Once again, Mr. Clark holds nothing back. He touches on a few subjects that people tend to stay away from, May, December romances. Teacher, student relationships, drug additions, lying with in the relationship. Total forgiveness. But does it all so brilliantly and so adult, you forget that these characters have a wide range in ages. All these characters play huge rolls in the story and even though this is about Nicky and Phillip, we have sub stories that spin off and make this well rounded and perfect. You completely get immersed in all of the lives, how they got there and why they are they way they are. They epilogue at the end was perfectly crafted to give us the HEA we needed. I love May/December romances as you may all know by now. For those who don’t, well, I do! There is just something about older man/younger man relationships that makes my heart thrum. I love how the maturity of one balances out that of the more insecure one. But with Before Sunrise, things are not what they seem. Nicky O’Hare is the younger man. A freshman and new member of the college swim team, he is the stereotypical hesitant guy with a man crush on his handsome coach. There is nothing he wouldn’t do for the man, he’d swim to win just to guarantee coach looks to him other than as a swimmer. Coach Philip Silva has his eyes on young Nicky. He’d recruited him a year before and now that he was in the swim team, Nicky is proving to be a good choice. But it’s not all platonic on his side. Never really looking for a relationship in his life before, he is confused with his growing feelings for the younger man. When Nicky and Philip finally get together for dinner, things went a little bit too fast for Philip’s liking and puts a stop. The next day, well that’s a different story. On the sidelines are the members of the swim team. Their life stories seemingly unconnected to Nicky and Philip’s. What their roles are soon become apparent. Good and bad, Nicky and Philip will realize who their friends really are, what they really mean to each other and a surprise realization that it is not the age that makes someone mature and responsible, it is the man. This was a sweet, romantic read and I couldn’t put it down despite my busy schedule life and dogs. Nicky and Phil’s story pulls on the heartstrings and it doesn’t take long before they guarantee your attention never leave them. Quite a different read from the author’s first book, Ancient House Of Cards whose men are mentioned here. This has a lighter feel to it compared to the first book but it is just as engrossing and all encompassing. The drop in star is because of something left unresolved though I wonder if there is a follow up story. I doubt there is, but I do wish it.